Army Staff Sgt. Timothy Raymond McGill, pictured here with his parents, Carol and Raymond McGill. Date of Death: September 21, 2013, Operation Enduring Freedom. Unit: Company A, 2nd Battalion 19th Special Forces, R.I. National Guard. ​Army Staff Sgt. Timothy McGill came from a family of police and firefighters, so when the 6-foot 6-inch, 280-pound football and hockey player graduated from Ramsey High School in 2001, he went straight into the military to serve his country. Sgt. McGill died in Afghanistan on Saturday, one of three soldiers killed when an Afghan wearing a security forces uniform turned his gun on American troops. He was 30. McGill is the second former Ramsey High School football player this year to be killed in Afghanistan while serving in the U.S. military. In May, Sgt. Eric D. Christian, 39, a Marine special forces staff sergeant and former Ramsey Rams player, was killed in action in Farah province. His younger brother, Phillip, said that attack was also by an Afghan National Army soldier, with whom Christian had been training. McGill was in Marine Corps boot camp on 9/11, and deployed to Iraq in 2005, before leaving the Marines and returning home to Ramsey. In 2008, he enlisted in the Army National Guard in Rhode Island, and three years later became a member of the Army’s elite Special Forces unit, or Green Berets. His father said he planned to spend his life in the military. them in the city of Gardez, capital of eastern Paktia province. "€œHe would respond to fire calls while he was on leave. "The attack, which is under investigation, took place inside a base of the Afghan army, according to a security official in Gardez. The area is near the Pakisani border and rife with fighting against the Taliban and other militants. McGill said his son could be physically intimidating, as he was on the Ramsey Rams varsity football team and in a local hockey league. The Rhode Island National Guard released a statement saying Sgt. 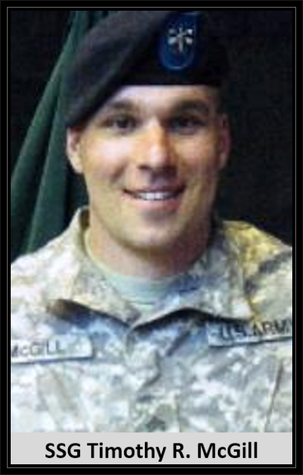 McGill died Saturday from wounds received by small arms fire. "Sadly, today we realized the sixth death of a Rhode Island National Guard Soldier in a combat zone since 9/11,” Major Gen. Kevin R. McBride, adjutant general and commanding general of the Rhode Island National Guard, stated. “We are once again reminded of the enduring sacrifice our soldiers and airmen have made, and continue to make, in service to this great country." Marine Staff Sgt. Eric D. Christian, originally of Ramsey, was klilled in Afghanistan last May.Photo courtesy of U.S. Marine Corps Fordes Special Operations Command He was the 152nd service member with ties to New Jersey to die in the wars in Iraq and Afghanistan. Raymond McGill said his son followed in the footsteps of his great uncles, and served as a member of the Ramsey Volunteer Fire Department, and a duty he fulfilled whenever he could even while in the military. “He would respond to fire calls while he was on leave,” his father said. In addition to his father, McGill is survived by his mother, Carol McGill, and two sisters, Megan McGill and Lindsay Vanderbeek. 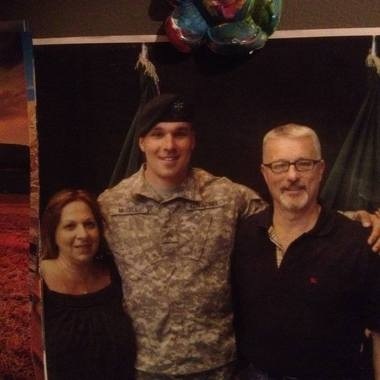 Raymond McGill said his son’s body will arrive Monday evening at Dover Air Force Base in Delaware, and following a military ceremony would be escorted up Interstate 95 by members of his National Guard Unit and the Ramsey Police Department. He said his son would be buried locally, though arrangements were still being made. Raymond McGill said the family had received an outpouring of support from friends of his son at military bases around country, including the Marine Corps’ Camp LeJeune in Jacksonville, N.C., and the Army’s Fort Bragg in Fayetteville, N.C., and Fort Myer, in Arlington, Va.
Master Sgt. Darren O’Donovan, who served with McGill in the Rhode Island National Guard, was at the family’s home in Ramsey today. O’Donovan said McGill was a weapons sergeant, a highly trained and physically demanding position for which his duties included going behind enemy lines to recruit, train and equip friendly forces for guerrilla raids, carrying out demolition raids against enemy targets; and interpreting and preparing combat orders.